After the British GP in mid-July the events which had been scheduled for Germany (July 31) and Switzerland (August 21) were canceled because of the backlash against motor racing in the wake of the Le Mans disaster in June. This meant that the Italian GP became the seventh round of the World Championship. The Spanish GP, which had been scheduled for October 23, was also canceled and so the F1 season after Monza. Mercedes-Benz also announced that it was withdrawing from motorsport activities at the end of the year and so the successful Mercedes team went to Monza knowing that the adventure was over. There were changes at the Monza circuit with two new high-banked curves built and the lap length increased from 3.9-miles to 6.2-miles. The new banking quickly caused problems with Giuseppe Farina having a big crash when a tire failed on his Lancia D50, Enzo Ferrari having acquired the Vittorio Jano-designed cars from Lancia. This resulted in Farina and Gigi Villoresi being withdrawn and Eugenio Castellotti switching to a Type 555 Ferrari. 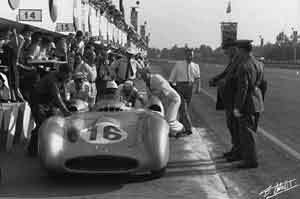 The Mercedes-Benz team was dominant with Juan-Manuel Fangio, Stirling Moss and Karl Kling sharing the front row, well ahead of Castellotti's 555. At the start Moss took the lead with Fangio, Piero Taruffi (in the fourth Mercedes-Benz) and Kling running at the front. By the end of the lap Fangio was ahead of the Mercedes-Benz train and there was little change up front in the early laps, although Kling did moved past Taruffi. On lap 19 Moss went into the pits with a smashed windscreen. He rejoined and began to charge hard to catch up but retired on lap 28 with engine failure. Kling also went out with gearbox trouble so that by the end of the race Fangio and Taruffi gave Mercedes a 1-2 finish, while Castellotti was a distant third for Ferrari.